Football is known to be a rough sport and its players are highly prone to physical injuries. But even though collisions take place from player to player in the duration of football games, it is still considered as a very exciting sport to play. Aside from having excellent physical health, you must have the right gears and equipment as part of your arsenal for every game. These will help keep you safe from injuries that may lead to serious issues in the future if not attended to. Additionally, having the right get-up also means that you can be very efficient and safe at the same time. Lastly, you must be able to conveniently move freely given the different situations you’ll encounter in the game despite having bulky equipment worn all over your body. And Nike is here to deliver. 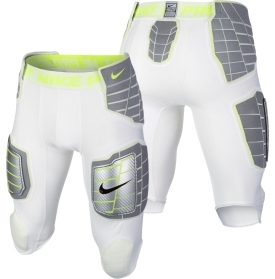 Why NIKE has the Best and Latest Football Gear/Equipment? On that note, you’d have to ask Why NIKE has the Best and Latest Football Gear/Equipment? Nike has been in the sports business for a very long time and has covered almost all of the sports genres with their gear and equipment. Each year, Nike produces products that have been improved through vast research and usage of modern technology. Have you ever wondered how they do this? It’s pretty simple actually. Nike puts a lot of effort into research and development and invites actual players to test out their products so they can tweak it until it reaches its maximum potential. And that’s why all the biggest players across all genres endorse Nike. And their product catalog keeps on growing. Not only do they have shoes but they’ve also gone into clothing, accessories and others just to address the needs of every athlete in the world. Shoulder pads are very important to football players. These help players on the field avoid shoulder injuries. In the same manner, body padding also helps prevent incurring massive damage from head on collisions with other players. For total body protection, Nike has come up with the Pro Combat Hyperstrong 3.0 which is designed to be light and won’t impede with your body’s movement. This is an improvement over the past versions of the Hyperstrong body protection suits Nike produced in the past. So, it is lighter, more comfortable and more importantly the most effective body padding to date that this company has produced. Most of the padding is situated in areas most likely to receive a lot of punishment on the field. This means you’ll find extra padding on the shoulder area, ribs section, hips and front portion of the thighs. These padding is made of breathable mesh so it remains cool no matter how heated the game becomes. And if you’re familiar with Nike’s sports clothing and apparel offerings, these body padding suits also feature the Dri-Fit feature which helps keep sweat away from the skin’s surface and dry the fabric off as quickly as possible. This wouldn’t be a complete rundown on all the great stuff Nike produces if we didn’t include shoes into the equation. If there’s any area in sports that Nike excels in, it would have to be in providing high quality footwear. If you look at the players in any sport, chances are you’ll see that familiar “Swish” sign that Nike is so famously associated with, and with good reason. Nike continuously improves on existing technology and strives to incorporate features into their shoes that enhance any athlete’s natural abilities to perform on the field. The cleat features the Flywire technology which fully encompasses the foot resulting in a very snug and comfortable fit. It also helps that the Flywire technology for the cleats is light and highly durable. The cleats featured on this pair of shoes allows for high traction to remove any chances of slipping back as well as easy entry and exit from the turf. These shoes are also very light at barely over 10 oz, you could literally fly across the field with these shoes on! 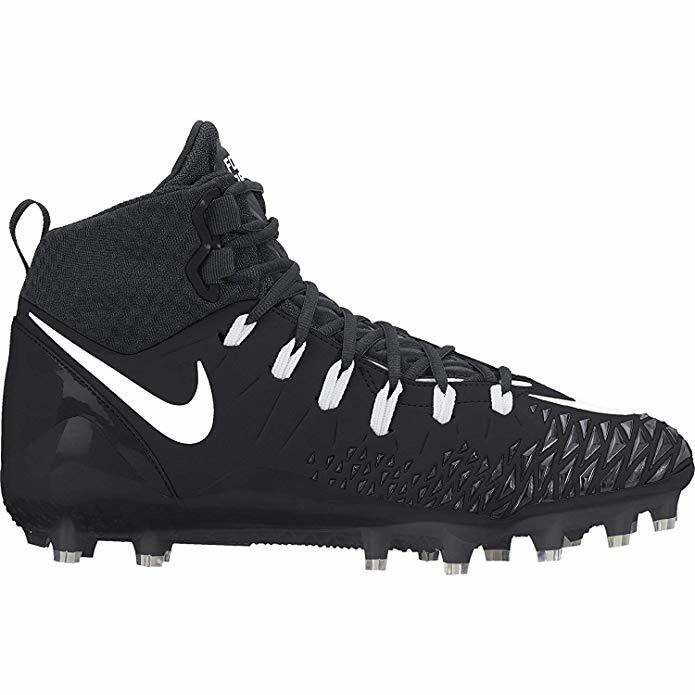 The Nike Force Savage Mid Football Cleats is perfect for linemen simply because these shoes provide high traction thanks to the lockdown fit it features. The Lunarlon technology found inside these shoes provides the necessary cushioning effect to help any player resist the amount of stress exerted from an opposing force efficiently. This same foam technology disperses the weight evenly each time it receives external impact. The result is a spring like reaction each time your foot hits the turf. It also doesn’t hurt that the cleats comes with excellent foot and ankle support. 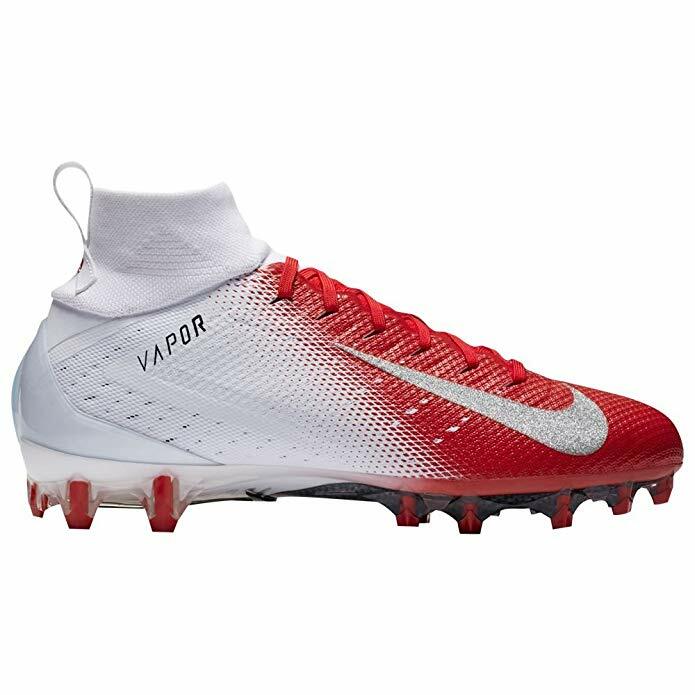 Although the Nike Force Savage Pro Mid Football Cleats is pretty light, they can take a serious beating thanks to the highly durable construction process involved in the manufacturing of these shoes. To complete the list, Nike’s Vapor Fly Receiver Football Gloves are already available in the market and they are extremely well crafted gloves that show you what a well funded company can do with an otherwise oft ignored piece of sports equipment. 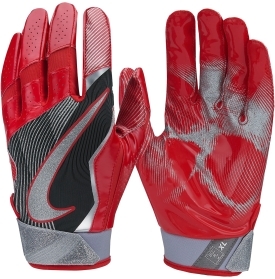 The Nike Vapor Fly Receiver Football Gloves is made of the highest quality of material to provide the most flexibility to your fingers. It is rather thin though. Still, it’s a good looking pair of gloves that performs what it’s supposed to do well enough. What is the best football to buy in 2019?